IKERLAT Polymers is located in Lasarte-Oria (Gipuzkoa) since 2006, nevertheless we began this adventure as a spin-off company of The University of the Basque Country, in San Sebastian, in 1998. The work carried out during these years has enabled us to earn the trust of the main diagnostic kits producers along the world. Nowadays we feel proud of having our polymer particles distributed over the 5 continents. Why to choose our particles? Our concept of “personalized” products means that instead of offering only a catalogue of referenced products (IKERLAT has a wide stock of latexes manufactured during all these years), we offer too the possibility of customizing different characteristics of the inquired dispersions, fitting them to the customer requirements. Currently IKERLAT commercializes 4 families of products (plain, functionalized, dyed and fluorescent particles), plus magnetic particles that are nowadays under development. In each family, there are customized variables such as particle size, functionality, parking area, color intensity… This allows the customer the possibility of finding a product which matches their process requirements. In addition, our technical staff is continuously working together with our customers in order to find solutions in processes involving latex particles. 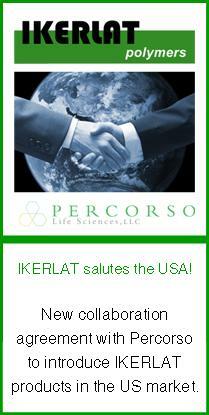 This collaboration becomes especially beneficial for the customer during the initial stage of the development of a new reagent, as IKERLAT offers the possibility of testing different samples, guided by the experience of our team. Our polymer particles are extremely uniform, with narrow size distributions having a CV less than 5%. We have implemented ISO 9001 and ISO 14001 standards which ensure our daily commitment to quality and environmental requirements. We maintain an accurate control of the production process which allows us to obtain a high reproducibility batch to batch. Our customers do not worry when a new lot is shipped, as they are confident that the variability will be minimum. One of the key strengths of IKERLAT is our R&D department, which is continuously working in close collaboration with our customers. We believe an earlier R&D produces the best results in terms of speed to market, quality products and customer satisfaction. Our concept of “personalized” products extend beyond design into manufacturing. Once the product has been validated by the customer, a batch is manufactured to be consumed only by this customer. This approach provides the customer with total control of the stock available.